Spider-created webs, and their dusty versions, cobwebs, exemplify the haunted house mystique. 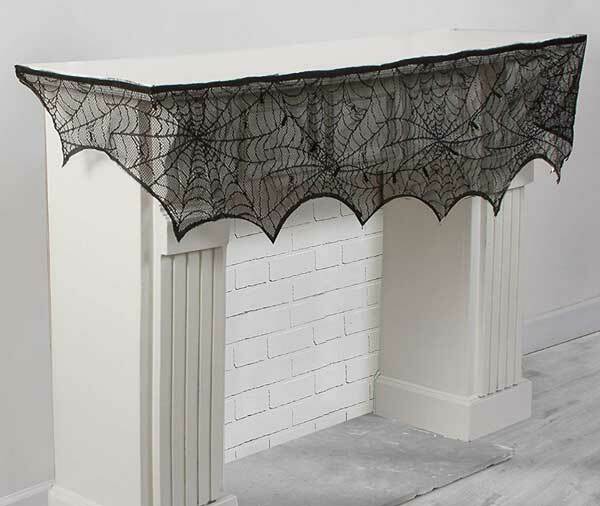 Thus, spider webbed fireplace mantel scarves are a staple of Halloween decor. 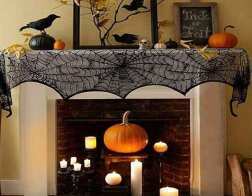 When the basic spider web mantel scarf adds bats and/or spiders to the mix, the Halloween vibe increases. You can use a single, large bat spanning the 23″ by 37″ mantel scarf (use two for wider mantels). 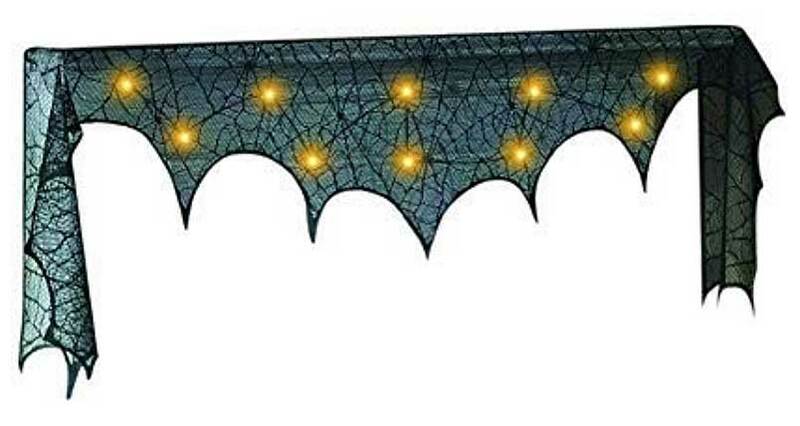 Or you can get a series of bats trimming the scalloped edges of a 20″ by 80″ mantel scarf. 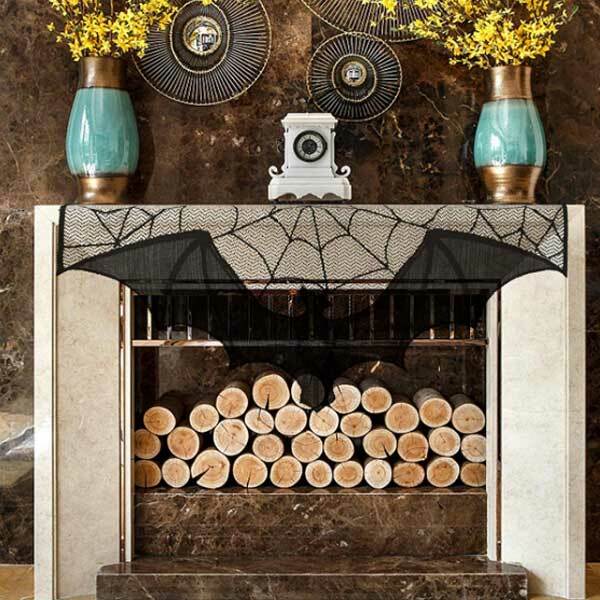 Whether one or more bats, these black lace mantel cloths capture the spirit of Halloween. No matter if you are thinking of pumpkin pie or jack-o-lantern face carving, pumpkins are prominent part of Halloween. Mantel scarves featuring these are a charming way to decorate your mantel. 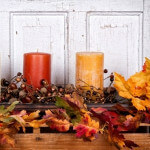 As an added bonus, ones featuring pumpkins can stay on the mantel through Thanksgiving. 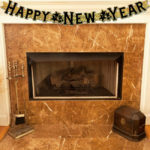 This white mantel scarf is best used with a dark fireplace mantel, fireplace surround, or wall behind the fireplace. The ghost bordered mantel scarf can cast a spell over your fireplace. The ghosts are more Casper than spooky, but hauntingly cute! Displaying pennants is a classic way to show your spirit and celebrate events. 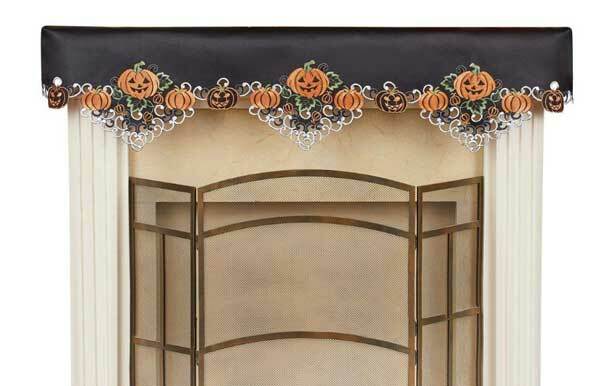 Therefore, this stunning Halloween fireplace mantel scarf has oodles of Halloween inspired banners. 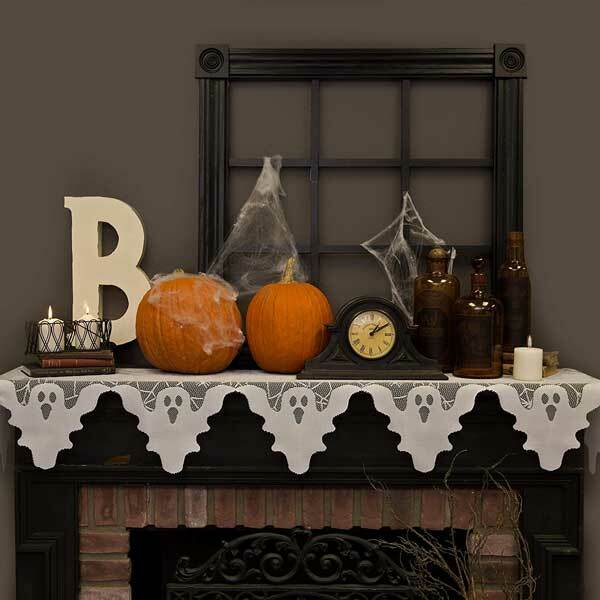 Bewitchingly clever, this Halloween mantel scarf is a definite smile-generator. It features hanging witch legs with black sequined shoes, whimsical layers of black lace, purple tulle, orange and purple sequined banners. Furthermore, it even has mini LED lights! Turn out or dim the lights in the room. 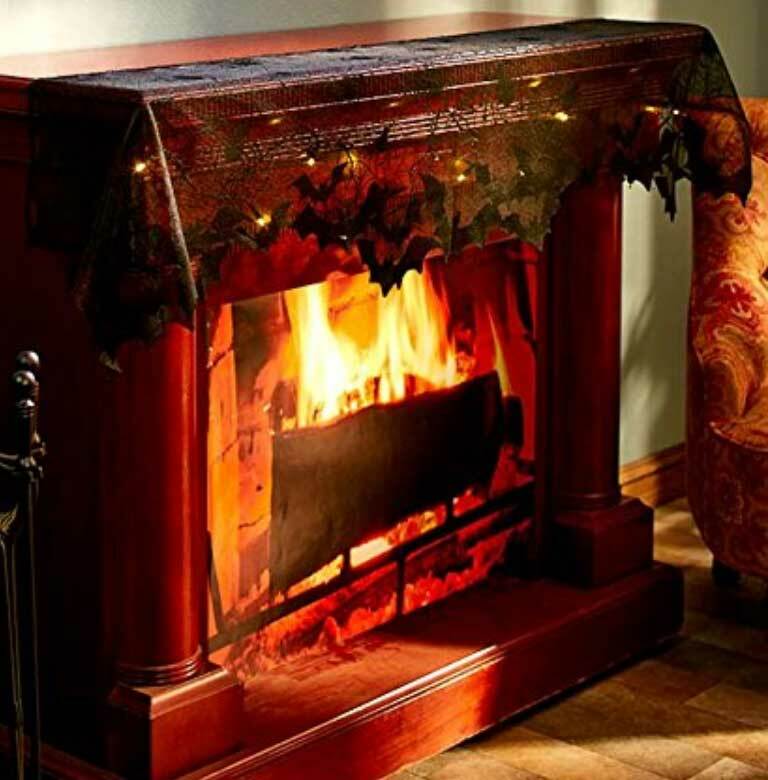 A lighted Halloween fireplace mantel scarf will add its own light, sparkle, and drama. In addition to traditional orange lights, some are available with purple lights. Many feature black gauze. Now your mantel has its first layer, the Halloween mantel scarf. 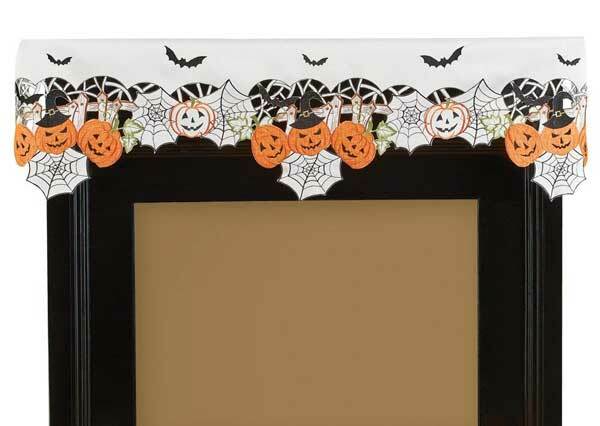 This base will pull together the Halloween decorative items you choose to top it with. Add whatever Halloween decorations suit your style. 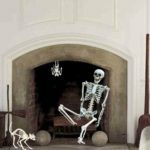 Candles, pumpkins, spiders, bats, human or animal replica skeletons, ravens, black cats, ghosts and more can adorn your mantel. 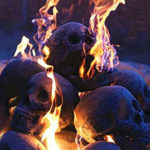 Plus, you can always fill the fireplace itself with fire logs shaped like human skulls! All of them will make a haunting memory for your Trick or Treaters, family and friends. 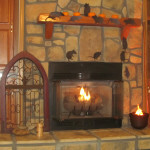 Finally, most Halloween fireplace mantel scarves fit on the mantel much like a tablecloth fits on a dining table. With the fireplace mantel scarf, however, the fabric drapes over three sides (front and both sides) of the mantel instead of over four edges. 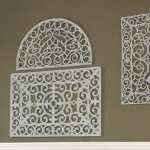 If they don’t stay in place by themselves, the decorative objects you use on top of them will weight them down. For very long mantels, a mantel scarf can just be draped over the center of the mantel. The fabric does not need to drape over the ends of the mantel. 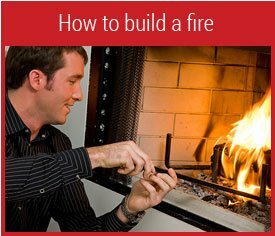 A less frequently use method is to attach the mantel scarf to the side and front edges of the fireplace mantel with double-sided tape. This allows you to have more fabric hanging down. but it will not provide the covering to the mantel shelf that the other method provides.